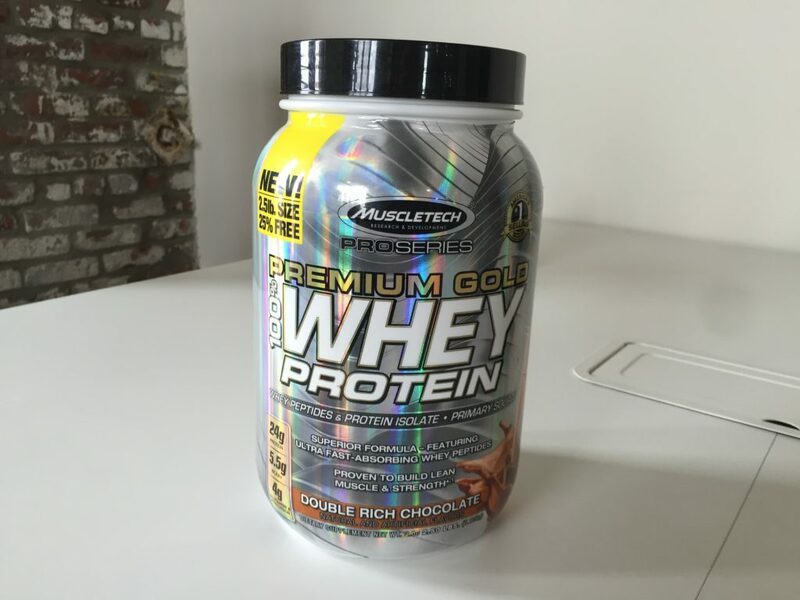 Home » MuscleTech Pro Series Premium Gold 100% Whey Review – Is Hydrolyzed Different? MuscleTech Pro Series Premium Gold 100% Whey Review – Is Hydrolyzed Different? Owned by Iovate Health Sciences in Delaware, MuscleTech is a pretty big name in the supplement business and they sell a ton of different products that are arranged under different product lines. They have the Performance Series, Lab Series, Essential Series, and Pro Series, all of which have their own whey powder. 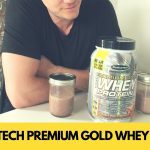 It’s kind of hard to tell the difference between these lines — on the website, each Series just uses different wording to say it’s the best for “performance” and “results.” I decided to try the MuscleTech Pro Series Premium Gold 100% Whey in the Double Rich Chocolate Flavor. A blend of three types of whey protein that's surprisingly tasty with water. One scoop provides 130 calories, 24 grams of protein, 4 grams of carbs (2 grams of sugar) and 2 grams of fat (1 gram saturated fat). As far as micronutrients ago, it has 10 percent of your daily calcium and 6 percent of your daily iron, which isn’t especially high. It also contains 160mg of sodium (7 percent of your daily intake) and 60mg of cholesterol (20 percent of your daily intake). What’s interesting about this product is that the first ingredient is hydrolyzed whey, which some athletes covet because it absorbs extremely quickly. This is good news for elite bodybuilders or if you just like having something in your belly before early morning workouts. But after hydrolyzed whey (also called whey peptides) you’ve got the standard whey isolate and whey concentrate, followed by cocoa, soy lecithin (for mixability), natural and artifical flavors, three kinds of gums that work as thickeners and stabilizers — xanthan, cellulose, and carrageenan — salt, and the artificial sweeteners sucralose (Splenda) and acesulfame potassium. So this product contains lactose, soy, and artificial sweeteners, plus it’s made in a facility that processes tree nuts, peanuts, egg, fish, shellfish, and wheat. Needless to say, if you have allergies or trouble digesting these kinds of products, this product might not be for you — particularly since it also doesn’t contain any digestive enzymes like amylase or lactase to help minimize digestive issues. There’s nothing really outstanding about this product besides the fact that it’s cheap. If you really want to find a protein powder that’s all natural or free of artificial sweeteners or minimizes digestive problems, you’re out of luck. It’s also not particularly low in carbs or fat. There are 4 grams of carbs and 2 grams of fat, and most competitors have closer to 2 or 3 grams of carbs and 1 gram of fat. While that’s technically 33 percent more carbs than, say, Optimum Nutrition, an extra gram won’t make a huge difference at the end of the day. Ultimately, if you can digest anything and you eat everything, MuscleTech will do the job of increasing your protein intake for little money. 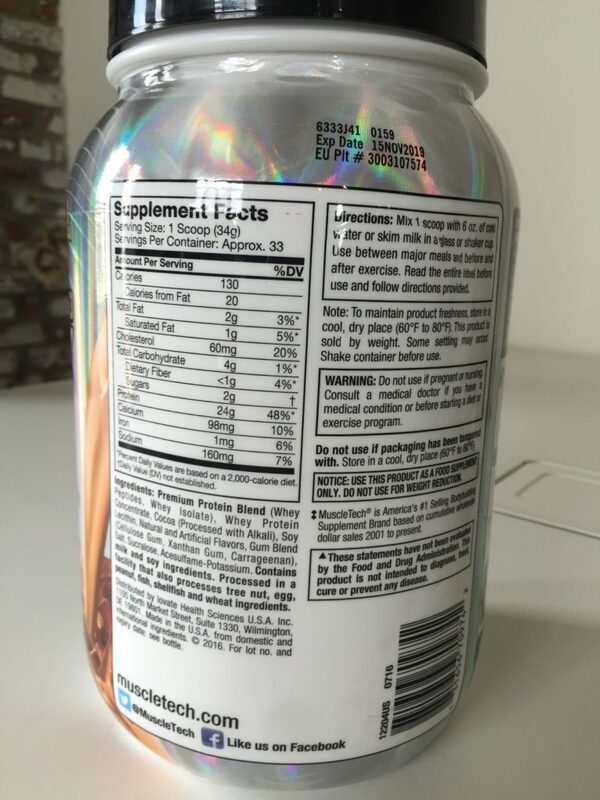 At the time of writing, you can only buy a 2.5-pound tub of protein on Bodybuilding.com. It costs 27 dollars for 33 servings, which is 82 cents a serving or 3.4 cents per gram of protein. That’s pretty cheap, despite the small size. It’s cheaper than Jym, Isopure, BPI, Cellucor, and it’s even cheaper per serving than Optimum Nutrition’s 2-pound tub, though not cheaper than their 5-pound tub. One good thing about the artificial ingredients is that the powder dissolves very quickly. There are no lumps, clumps, or bumps — you could almost be convinced that nothing had been mixed in at all. Double rich chocolate is a very strong, rich, and creamy taste that mixes great with low-fat milk. With whole milk, it’s a little too overwhelming, and with water it’s too bland. Stick to low-fat milk or almond milk and you’ll be delighted. 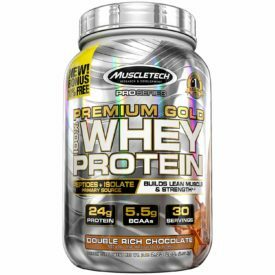 If you have almost any dietary restriction, MuscleTech’s Premium Gold Whey isn’t for you. But if you’ve been meaning to experiment with hydrolyzed whey and you baulk at the price of most hydrolyzed whey protein powders, it’s worth a purchase.